A treadmill is a great resource for fitting in a cardio workout, but wouldn’t it be great if you could get some exercise while you’re at work, saving you a lot of time? If you’ve never heard of an office desk treadmill, now is the time to learn more about what a wonderful tool it is for helping you burn calories and tone your lower body, all without leaving the office. The Sportstech DESKFIT DFT200 Office Desk Treadmill is a premier choice with plenty of bells and whistles to make your exercise time as efficient and worthwhile as possible. Here’s everything you need to know before you buy. 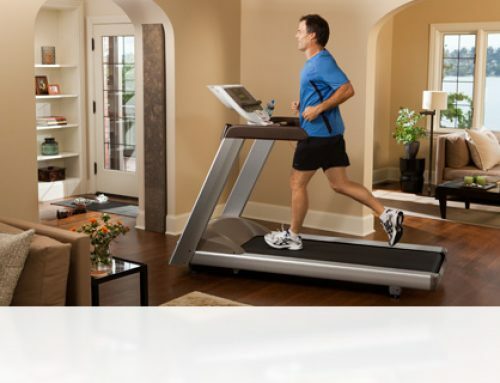 This office treadmill features the running pad but doesn’t have the bars and handles that a traditional treadmill has. This makes it simple to slide under your desk at work so you can run or walk on it while you read emails, watch work tutorials, or meet with co-workers in a laid-back way. There’s a tablet holder and you can sync the treadmill with an app, making it convenient and easy to fit in some cardio while you’re in the office. There are many benefits to walking or lightly running while you’re working. Obviously, you’ll burn calories and tone the muscles in your legs, buttocks and core, but your health benefits in other ways as well. Research shows that exercise helps prevent illness, so if you are too busy to get to the gym, using this office desk treadmill can help you ward off sicknesses and keep you from missing work. 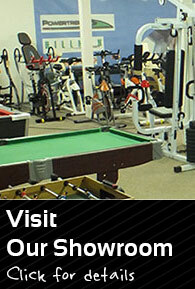 You can also boost your cardio endurance, promote healthy weight loss, and prevent a wide range of diseases. In addition, using the treadmill while you work can improve your concentration and help you get more done. The app that comes along with the treadmill makes it easy to track your calories burned, fitness level, and the number of steps and distance you’ve gone. One of the great things about this office desk treadmill is that it comes with a remote control, which makes it easy to get it ready for use with just the touch of a button. The controls are fully compatible with the fitness app and you can use it to customise the speed of the treadmill, the duration of your workout, and you can also use it to pause and start the treadmill as necessary. These handy controls mean you can use the treadmill while you have a meeting without even having to change your clothes, or you can switch into workout gear and get a full cardio workout during your lunch break. Either way, the handy controls are easy to understand and simple to use, making exercise something you’ll always have time for, whether you’re at work or not. There’s a lot to love about the Sportstech DESKFIT DFT200 Office Desk Treadmill. One of the greatest specs is that you can easily slide it under a couch or desk when not in use. 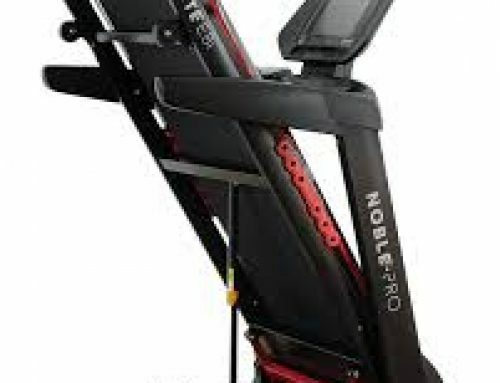 The treadmill measures 130 x 56 cm and weighs 110 kg. It is 12 cm high and can reach a max speed of 7.1 km/hour. The treadmill is compatible with both Apple and Android devices and the instructions come in several languages for ease of use in a large variety of workplace settings. 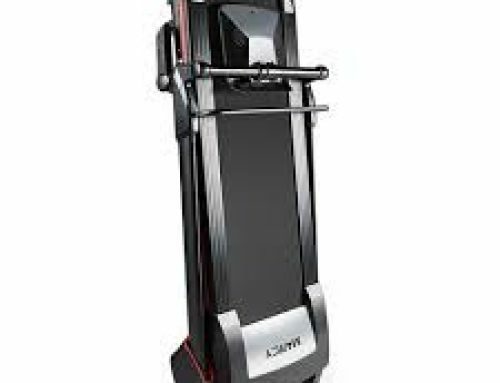 The engine on the treadmill features a multi-layer damping system, which means it’s quiet and easy on the joints. The controls are simple to use and monitoring your progress is easy to do with the tracking app that keeps track of your steps, distance, calories burned, and helps you stay on top of your workout program. The treadmill can operate at 8 levels and most users report a quiet run. Most users also like how easy it is to pause, start, slow down or speed up the treadmill for the most customized workout possible. This lightweight (when compared to traditional treadmills) makes it easy to push under your desk and slide out of your way when you’re not using it. While this treadmill is much lighter than the average similar product, it’s not practical to take it back and forth from work to home with you. It’s not too hard to slide, but it’s not so conducive to packing up and carrying around with you if you need to. One of the best things about the Sportstech DESKFIT DFT200 Office Desk Treadmill is how easy it is to use. It’s simple to set up under your desk and the compatible app makes it so easy to keep track of your workout progress and track your steps, calories and distance with your smartphone. The app is also easy to set up and with just a few clicks you’re on your way to a healthier and more fit office and body. There are so many things to like about the Sportstech DESKFIT DFT200 Office Desk Treadmill. It’s so easy to use, which is one of the best things about it. We also loved how simple it is to get in shape and lose weight even if you don’t have time to go to the gym every day. This treadmill is the ideal choice for a busy professional and offers the perfect chance to get fit even with a busy schedule. Despite being billed as portable, the treadmill isn’t actually light enough to move around with ease. It can be slid across the floor, but you must be careful since the legs can’t be bent without damaging them. You’ll get a great workout from this treadmill, but it won’t give you much of an upper body workout so be sure you add some weight training for your arms and back as well.